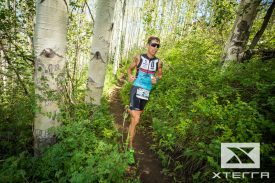 Forty-five elites are scheduled to compete at the XTERRA Pan America / USA Championship race in Ogden, Utah next Saturday, September 16. As the culmination of a series of off-road triathlons spanning South and Central America, Mexico, the Caribbean, Canada, and the U.S., the contenders are coming from near and far, and with $80,000 in prize money at stake and cameramen capturing all the action for a nationally broadcast one-hour TV show, the stage is set for XTERRA’s best to show what they can do. Forty-five elites are scheduled to compete at the XTERRA Pan America / USA Championship race in Ogden, Utah next Saturday, September 16. As the culmination of a series of off-road triathlons spanning South and Central America, Mexico, the Caribbean, Canada, and the U.S., the contenders are coming from near and far, and with $80,000 in prize money at stake and cameramen capturing all the action for a nationally broadcast one-hour TV show, the stage is set for XTERRA’s best to show what they can do. The challenge starts with a one-mile swim in Pineview Reservoir (4,900-feet elevation), follows with an 18-mile mountain bike leg that climbs more than 3,000-feet to the top of Sardine Peak (7,300-feet elevation) and culminates with a 7-mile trail run featuring another 700-feet of climbing on trails around Snowbasin Resort in the Wasatch Range. The course, they say, is best-suited for mountain goats. In the last few weeks we’ve caught up with some of the race favorites including reigning champs Josiah Middaugh and Suzie Snyder from the U.S., and top contenders Bradley Weiss from South Africa (who just won the XTERRA European Championship) and Kara LaPoint from Colorado, but the talent goes well beyond those four. In the men’s race Mexico is well represented with Mauricio Mendez, the current XTERRA World Champion. He was second to Middaugh at XTERRA Beaver Creek this year and 3rd at this race in 2014 as an 18-year-old. XTERRA Argentina Champion Gonzalo Tellechea, who is currently ranked 5th in the Pan Am Pro Series, is on the start list along with his countrymen Andres Darricau and Mario de Elias. Representing Brazil is Felipe Moletta, the reigning and three-time XTERRA Brazil Champion. Jean-Philippe Thibodeau, who finished in the top four at four races this year and is ranked fourth in the Pan Am Pro Series, will carry the torch for Canada while rookie elite Cedric Wane (ranked 6th) represents Tahiti. The Kiwi’s are in full force with Kieran McPherson, the XTERRA Thailand Champion who is ranked 3rd in the Series, Kyle Smith, who was 3rd at XTERRA New Zealand and the ITU Cross Tri World Champs in Canada a few weeks ago, and Alex Roberts. The Aussies are led by Ben Allen, who finished 3rd at XTERRA Worlds twice in the last three years. Markus Benesch and Dominik Wychera from Austria and Julien Buffe from France add a European twist to the mix. For Buffe, ranked 8th on the tour, this will be the fifth race on the Pan Am Pro Series for he and his girlfriend Morgane Riou. And then there are the Americans, who will also be racing for the USA Championship title. Branden Rakita leads the charge as the Pan Am Pro Series points leader, having finished in the top seven at nine events this season. Sam Long could be the dark horse, he finished 3rd at XTERRA Beaver Creek behind only Middaugh and Mendez this summer. Chris Ganter says he’s looking forward to another shot at this course, where he did his first XTERRA as a pro back in 2010. Alex Modestou, after a busy legislative season with his “real job” as an education data and policy analyst, is hoping to find the form he had in 2014 when he finished fourth at this race. Others in the mix include Walter Schafer, Michael Nunez, Ian King, Brad Zoller, newbie local pro Andrew Fast in his first-ever XTERRA, and the senior statesman of the bunch, 42yo Brian Smith. The women’s elite field is just as diverse as the men’s with racers representing France, Brazil, Canada, Scotland, New Zealand, the U.S., and the U.K.
Two-time XTERRA World Champion Lesley Paterson finished third on this course the first time she raced it in 2009. She was second in 2010 and 2011, and she won it in 2012 and 2013. This year, after a season spent touring the nation promoting her book The Brave Athlete, she says she’s ready to get back in the dirt. To win it she’ll have to get past Snyder, who won five races this year included a head-to-head against Paterson at Oak Mountain. In their next head-to-head, however, Paterson won big at Beaver Creek, so this will be the rubber match. Other hopefuls include Morgane Riou from France, who did 11 XTERRA races this season including a stretch of eight in eight weeks this summer. In her last race, she won XTERRA Dominican Republic, and is ranked 3rd in the Pan Am Pro Series. Lizzie Orchard from New Zealand was the runner-up here a year ago, finishing just three minutes behind Snyder and is fresh-off a third-place showing at the European Championship in Denmark. Canada is sending a strong contingent with Katie Button, Katharine Carter, Annie Bergen, and XTERRA newbie Holly Henry. Brazil counters with Sabrina Gobbo, winner of four straight XTERRA Brazil Championships, and Laura Mira Dias who is ranked fourth in the series. In addition to Snyder and LaPoint, the American’s will be represented by 2015 USA Champ Emma Garrard and Julie Baker, who finished third in Utah last year. Other U.S. racers include Genevieve Evans, Heather Zimchek-Dunn, Caroline Colonna, Jessie Koltz, and Anne Usher. Follow the elite race live on twitter @xterraoffroad and find live video look-ins on Facebook/xterraplanet starting at 9am MST on Saturday, September 16. Learn more at www.xterraplanet.com.